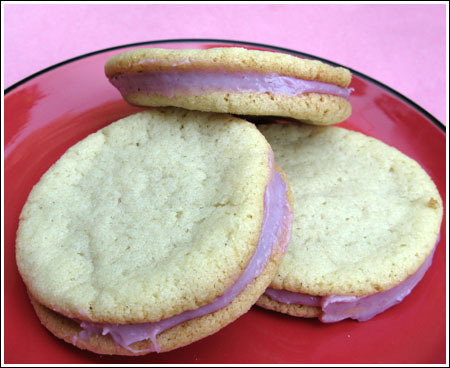 Mine were a little on the sweet side, but these raspberry cream sandwich cookies received good reviews on Martha’s website and Recipezaar. I think I would have liked these a bit more had I used an actual vanilla bean as called for, but I checked H.E.B. and the price on one single vanilla bean is $7.99. Think of how much good chocolate I could buy for that! So here they are, sans vanilla bean. Not sure why the filling turned purple. Thanks so much for reading Cookie Madness and for the comment :). About the cookies, I’m glad to hear my filling wasn’t the only one that was purple. It was pretty, but definitely not as pink as Martha’s. Maybe she uses some special type of rasbperries. Also, I bought a bundle of vanilla beans on eBay. Now that I have the beans I will give the cookies another try. Hey there- I just found your blog through a friends and wanted to say how great it is! I love the recipes and writing- everything. I also wanted to say that I’ve made these cookies twice and both times the filling came out purple. I’ve tried fresh and frozen raspberries both- so I’m not sure how they got that beautiful light pink filling in the photo! I guess it wasn’t just my head cold, then. Thanks for letting me know. Patricia, it will be interesting to see what you think. Anna, I have these bookmarked, too. Yours look great, sweetie! I made these a while back and I have to agree with you – they were very sweet and I didn’t have a head cold. My husband, who pretty much eats anything, didn’t want to eat these as he felt they were way too sweet. It is on my list to do these again as I love raspberry and try to cut back on the sweet. These look great, I think raspberries and white chocolate go really well together. Are the cookies like of like a sugar cookie? Anna, Can I just say how wonderful it is to escape to your blog when all the other news in the world seems so bleak! Thanks for keeping us all baking (or drooling over what you have baked)! I cannot wait to try these! I’m having a little bit of chocolate overload these days so a fruity treat will be a nice change of pace. I was going to mention ebay, but someone beat me to it. I got a half lb on ebay once for like 7.99( shipping included). I made my own vanilla extract too. Bakingblonde, I’d love to hear your take on these. They’re pretty, but sweet! Katrina, these would be perfect for a baby shower. Go for it. Veggiegirl, I almost made your blondies today but had a last minute change of mind. Pamela, THANKS!! I just ordered a bunch of them for $4.99. Take that, H.E.B.! If you’re looking for vanilla beans that don’t cost you an arm and a leg, I would look on ebay. I know it sounds odd, but you can find bunches of 25 (or more) vanilla beans for a little more than your 1 $7.99 vanilla bean. Don’t worry Anna, purple is very in right now! Cookies look delicious! I have never seen anything like these! I love raspberry. I bet white chocolate drizzled on top would be fabulous!